Department » Development Services » Divisions » Search for Permits / Case Info. Welcome to Austin Build + Connect (AB+C), the new web portal to search for development related information or conduct business with the City. Search for plan reviews, permits and inspections and the status of those cases/permits. View Issued Construction Permits (one week maximum). View the Online User Manual for public search assistance. 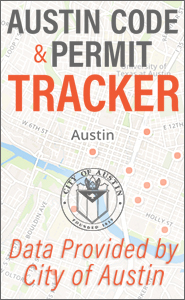 Registered Users can submit an online permit application, pay for permits, schedule an inspection, assign permits, apply for Right-of-Way permits, etc. The City of Austin makes every effort to produce and publish the most current and accurate information possible. No warranties, expressed or implied, are provided for the data herein, utilization of the search facility indicates understanding and acceptance of this statement by the user.